Fashionable women, dark-haired Saudis and blonde Eastern Europeans alike, filled the gold-trimmed halls of Riyadh’s Ritz-Carlton Hotel, marking the start of Saudi Arabia’s first fashion week last week. Models and makeup artists preparing for the inaugural Saudi episode of Arab Fashion Week that ran Apirl 10-14 said they were surprised the event was taking place in the deeply conservative Muslim kingdom. Yet, restrictions persist. Last Tuesday’s reception was open to men and cameras, but only women were permitted at catwalk events and outside photography was barred. Women in public places in Saudi Arabia, the birthplace of Islam, wear abayas – loose-fitting, full-length robes symbolic of piety. No abayas were featured on the catwalk. The event hosted invitation-only fashion viewings and a Harvey Nichols pop-up store in a tent that was still being erected hours before the first show. Another tent held the catwalk, featuring designers from Brazil, Lebanon, Russia, Saudi Arabia, the United States and the United Arab Emirates. 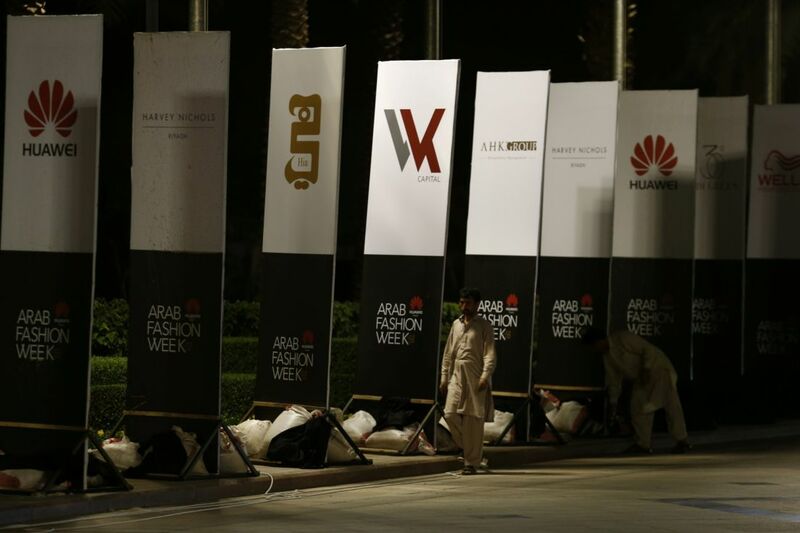 Layla Issa Abouzeid, Saudi Arabia country director for the Dubai-based Arab Fashion Council organizing the event, said 1,500 people were expected to attend, including 400 from abroad.